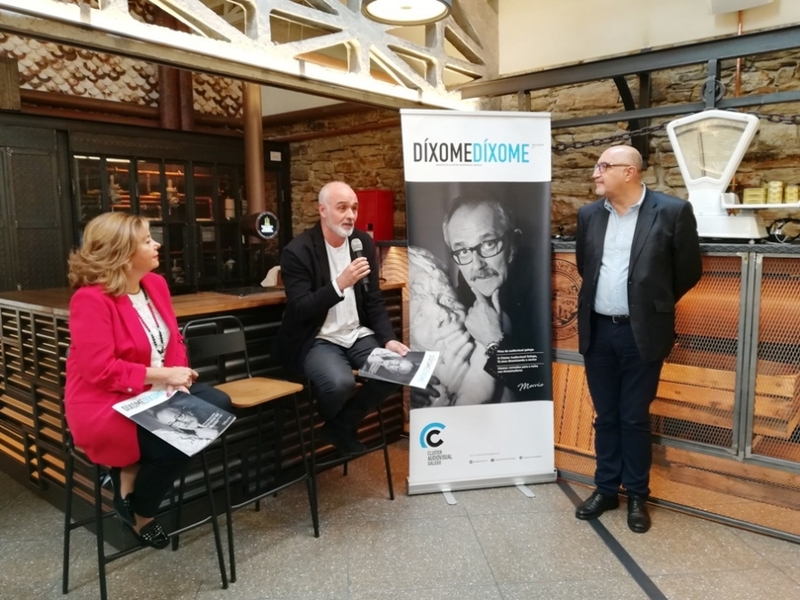 The Galician Audiovisual Cluster presented its new magazine "Díxome Díxome" at an event held on Tuesday, the 23rd, at the La Galiciana market in Santiago, which brought together numerous representatives of the cultural and audiovisual sector. The publication will serve as a showcase to show all the creativity and the artistic and technical potential of the Galician productions and will promote its consumption among the public. Those in charge of presenting this new editorial project to the attendees by the Galician Audiovisual Cluster were its president, Jorge Algora, and the vice president and head of Communication Strategies, Miguel Conde, who were accompanied by the editor of the magazine, Mar Delgado. During his speech, Jorge Algora, who opened the event, presented the magazine as a common project for the entire sector, and highlighted the importance of having its own space that accommodates and unites all the Galician audiovisual. For his part, Miguel Conde was convinced of the importance of this editorial project that was born thanks to the efforts of the Galician Audiovisual Cluster. "This goes hand in hand", he said. "We have to help consolidate the Galician audiovisual, which already has a lot of prestige, and" Díxome Díxome "is born from that idea". We believe, also, that a paper format, in addition to digital, can help to know much more what we do. " The magazine will also tell what is cooking, projects such as filming, which may be of interest to the public, he said. Conde also explained that "the magazine will be the banner that unites us, that unites the entire sector, to achieve that it consumes more Galician audiovisual." For Mar Delgado "the magazine is a magnificent tool to give visibility to the Cluster among the partners and among the suppliers. This publication is an added value that not only enhances communication between the sector, it also opens a window for society in general to better understand the Galician audiovisual world." Mar Delgado explained, in addition, that the magazine was created with the aim of being a publication that reflects the work of the sector, present and future projects, and also to offer the reader useful information. "It wants to be the best of the shop windows through an innovative design, very careful and with great presence of the image". The birth of this magazine was covered by a good number of Galician audiovisual professionals, among whom were producers, directors and directors as well as representatives of industry associations. The event also counted with the presence of well-known faces from our screen, such as the Galician actresses Estíbaliz Veiga, Iria Lamas, Carmen Méndez or Mayka Braña who did not want to miss the event. With this new publication, the Galician audiovisual has since the summer with a new information space to show all the potential of the sector and its professionals. In addition, the Cluster now has its own place with very diverse contents designed to value the industry and where there will be space for all professionals, both those in front of and behind the scenes. The magazine, published quarterly, has very diverse sections, forming a larger editorial space to give visibility to the projects and creations of the professionals who carry out their work in Galicia. It contains diverse content such as information, training or innovation, becoming an informative and entertaining space, but also a discussion table gathering current issues that affect the audiovisual.